The Knots of May – Women’s morris side formed in the Autumn of 1974 in Brighton. The children’s game. “Here we go gathering nuts in May” is a perversion of “Here we go gathering knots of May,” referring to the old custom of gathering knots of flowers on May-day, or, to use the ordinary phrase, “to go a-Maying.” Of course, there are no nuts to be gathered in May. The Knots of May are a women’s Morris team formed in the Autumn of 1974 in Brighton. We are always looking for new dancers. We practise every Tuesday during the winter in Lewes. If you would like to join us please introduce yourself during the summer season. Band membership is by invitation only. Sadly, one of our founding members, Lynda Moquet passed away on the 18th August 2017. We have dedicated a little tribute to her here. 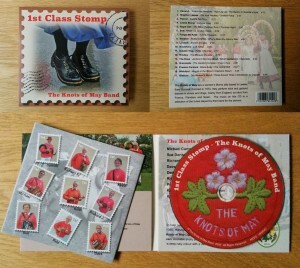 The new Knots of May Band CD “1st Class Stomp” is now available by mail order, or at any pub or festival stand.